ORANJESTAD, Aruba - November 30, 2018: Aruba Hotel & Tourism Association (AHATA) had its annual presentation of the AHATA Excellence Awards to recognize the most impressive employees in the tourism sector. Members of AHATA employ about 10,000 people locally, and for 2018 they nominated the best 48 for the honor of being considered for the AHATA Excellence Awards. AHATA's CEO, Tisa LaSorte, received the nominees and their guests at the ballroom of The Ritz-Carlton, Aruba. 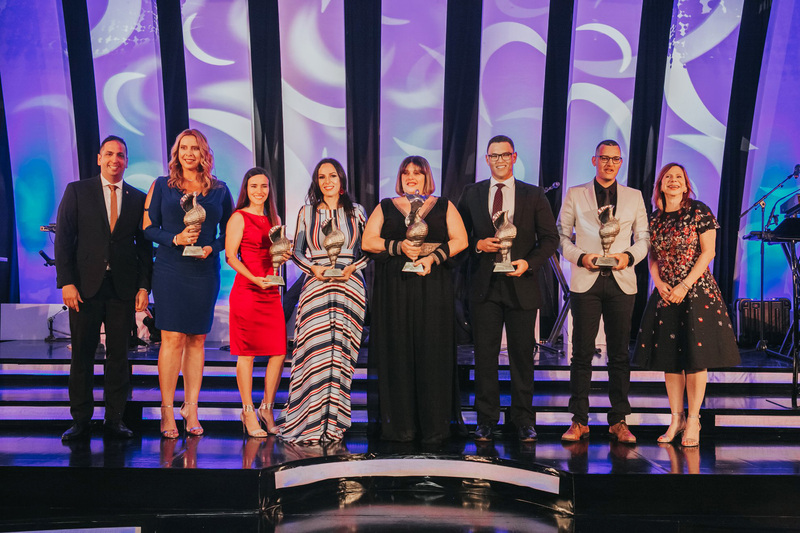 Nominees sat together with their colleagues and managers to enjoy a spectacular night full of appreciation for their contributions to the success of Aruba’s tourism. During the official welcome speech, Tisa LaSorte thanked the minister of tourism, Danguillaume "Dangui" Oduber, for his presence and announced that the purpose of the elegant night was to especially recognize the pillar of our tourism industry—the human element, Aruba’s people. A jury of three independent and impartial persons in the tourism sector interviewed all the nominees in the last few weeks and selected the winners for the five categories. The board of directors of AHATA selected the winner of the Lifetime Achievement Award. The master of ceremony, Larissa Bermudez, thanked the sponsor of the dinner and the celebratory evening, De Palm Tours, and then called each nominee on stage to receive a certificate as a video of the nominee played in the background. The following winners were announced: Berlinda Engelhardt, Navigator at Renaissance Aruba Resort & Casino, Employee of the Year; Shemuel Koolman, Assistant Rooms Operation Manager at Aruba Marriott Resort & Stellaris Casino, Supervisor of the Year; Barbara Nieuwmeyer-Bregita, Senior Sales Manager at De Palm Tours NV, Manager of the Year; Axl Jordy Ismail, Director of Casino Operations at The Ritz-Carlton, Aruba, Young Tourism Professional of the Year; Nathaly Stanley, Sustainability Manager at Bucuti & Tara Beach Resort, Sustainability Champion; and Beverly Williams Perez, Banquet Manager at Hyatt Regency Aruba Resort, Spa & Casino, Lifetime Achievement Award. AHATA awarded each winner with an original symbolic sculpture by local artist Gilbert Senchi. All the nominees also received a gift. During the night, two checks were presented, one for Colegio EPI, Hospitality & Tourism unit, and the other for the University of Aruba, Hospitality & Tourism Management. Armin Solognier, senior business developer for Caribbean Mercantile Bank, presented the donations to the schools to help support education in hospitality. At the end of the night, everyone present enjoyed the music of NBO. AHATA’s board of directors wants to thank its sponsor, De Palm Corporation, for making the AHATA Excellence Awards celebration possible. The board would also like to applaud all the nominees for their dedicated commitment to excellence.